Should I “Reconfigure” or change “Physical Properties”? What’s the difference? Back in April in this space, we discussed what effects using the “Reconfigure” function in Aventa has on device performance. To recap, ReSound uses “Reconfigure” as way for the fitter to let the software know what is attached to device for the particular fitting. Hardware variations such as receiver, thin versus standard tubing, dome versus occluding earmold, and hook filters all affect the electroacoustic performance of the hearing aid. The fitting software must know these parameters in order to apply the correct gains so that what you see on the fitting screen approximates what you get in the ear of the patient. While all hearing instrument manufacturers must take into account the hardware configuration of the device in applying gain, ReSound is unique in using the reconfigure approach. This can understandably be a cause of confusion for the fitter who works with multiple manufacturers’ products. Other manufacturers make changes in the gain applied based on settings the fitter makes in the acoustic properties menu in their software modules. Thus it is not surprising that many expect the changes they make to “Physical Properties” in Aventa to do the same. However, Physical Properties settings have no effect on the gains applied in ReSound products. The changes that can be observed in the Simulated Insertion Gain view of Aventa when Physical Properties are changed are for display purposes only. The intention of Physical Properties options is to more accurately simulate the real ear response with the given instrument settings. The bottom line for those fitting ReSound products is that changing anything in the Physical Properties menu will not result in any changes in the hearing instrument, and is thus not a fine-tuning tool. The gain controls should be used for fine-tuning instead. 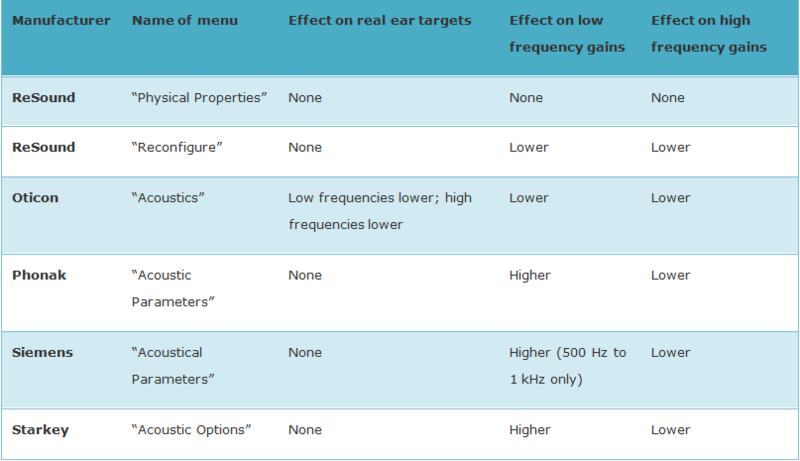 Below is a very basic summary of how ReSound and some of the other hearing instrument manufacturers use the information regarding acoustic properties, such as dome type and venting, in the fitting. This summary was made by comparing the 2cc coupler gain view for receiver-in-the ear devices fit to the same audiogram, but with the most open versus the most occluding venting option available in the software. The changes indicate what happens when a more open venting option is chosen compared to a more occluding option. Only one of the manufacturers reviewed employs a different fitting rationale for open fittings versus occluding fittings of the same device. All account for residual ear canal resonance with a more open fitting by decreasing the gain around 3 kHz, although some do reduce high frequency gain even more. Regarding low frequency gain, some manufacturers appear to compensate for a more open fitting by making rather large increases in the lows. Note that since actual devices were not measured, it is uncertain whether these low frequency boosts represent the actual programming, or only a display offset. As always, fitters are encouraged to learn about the products they work with by measuring them on the ears of their patients. Despite the advances in hearing instrument technology, this is the most straightforward way to gain an understanding of what the hearing instrument is doing, and how changes in the software affect this. 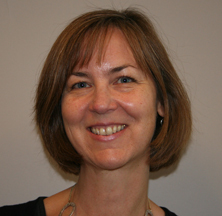 This entry was posted in Global Audiology Monthly Column, ReSound Newsletter and tagged Aventa 3. Bookmark the permalink. 1 Response to Should I “Reconfigure” or change “Physical Properties”? What’s the difference? Recently I saw a new patient who had been fit with a hearing aid 4 or 5 years ago. Unfortunately, the professional who had performed the fitting had used what was designed as an open-fit hearing aid and attached a half-shell earmold to it without compensating for this change in any way in the software or during the programming process! This resulted in the hearing aid delivering way more low and mid frequency gain than appropriate without any clue in the software that this was happening. The patient felt his hearing aid was “too loud” and the professional responded by reducing gain across the board. This was repeated over several office visits and ultimately left the patient with a hearing aid set to such a low level of gain that it might as well have been muted! Fortunately, I was able to guess what had went wrong and had him loving how his hearing aid sounded by the end of our appointment. Sadly, this was AFTER missing out on at least 4 years of better hearing and most likely a negative impression of the brand of hearing aid involved. I’m glad you’re bringing this subject up. Most of us are aware of how important adjusting “physical properties” can be, but based on the patients I see I know there are at least a few out there who are making this mistake.